One of the UK's top desi Bollywood and bhangra brass and dhol bands available for weddings, corporate events or festivals. Combining the English word 'band' with the Hindi word 'baja', the Indian Band Baja available for hire through Kudos Music does exactly that by bringing together the sounds of the east with the west leaving you with a breathtaking, truly musical performance. Ronak Mela Baja is the group available through Kudos Music, a truly one-of-a-kind collaboration of musicians that have brought together their varying sounds to create something spectacular. 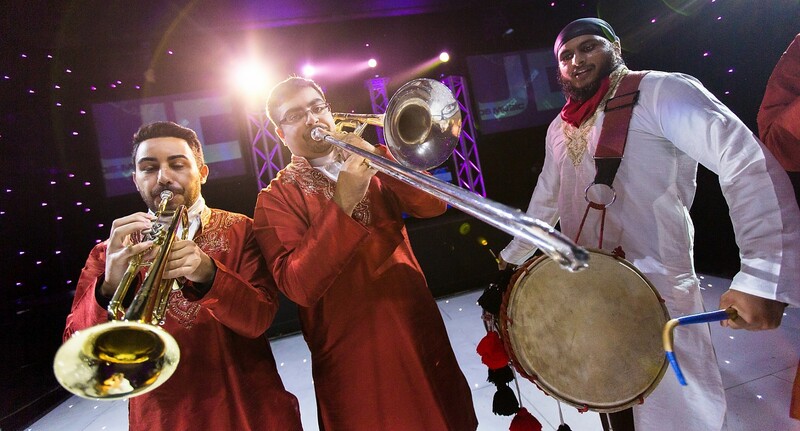 They have been providing UK audiences with quality classical brass music since the groups founding in 2004, specialising in Bollywood and Bhangra songs for real authenticity and to add a special something-different to your special day. The instruments used in the bands performances include the trumpet, French horn, trombone, tuba, percussion and of course the sounds of desi dhol and instrumentation to add that eastern influence. A performance from this band baja really will be unique if this is what you choose to have at your wedding or event, keeping your guests talking for months afterwards after having a massive, impressive impact on them all. Ronak Mela Baja's repertoires includes massive bhangra hits such as 'Gur Nalo Ishq Mitha' and 'Apna Punjab' as well as major Bollywood numbers including 'Bole Chudiyan', 'Tujhe Dekha Toh' and 'Aaj Mere Yaar Ki Shaadi Hai'. A completely different way of bringing live Bollywood and bhangra music to your event or special occasion, the Indian Band Baja available through Kudos Music are ideal. Get in touch with us today for this east meets west musical collaboration! Why not book a Kudos Indian Band Baja for your wedding or event today! Contact the sales team to see how we can find the perfect entertainment for you.